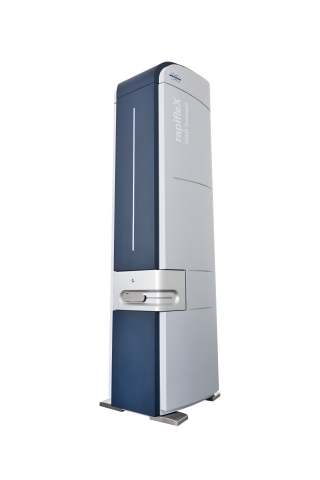 ST. LOUIS--(BUSINESS WIRE)--At the 63rd ASMS Conference on Mass Spectrometry & Allied Topics (ASMS), Bruker (NASDAQ: BRKR) announced the launch of the novel MALDI Tissuetyper solution, based on the new rapifleX MALDI-TOF Mass Spectrometry system. The introduction of the revolutionary rapifleX as the new instrument platform for MALDI imaging anatomical pathology research further enhances Bruker’s leadership position for MALDI-TOF-based applications solutions. The new rapifleX system eliminates many previous bottlenecks in mass spectrometry imaging (MSI), with much improved speed, throughput, ease-of-use, robustness and spatial resolution. At the same time, MSI maintenance efforts are reduced to a minimum by a streamlined design of the ion source for maximum uptime and optimized accessibility. The new MALDI Tissuetyper solution based on the rapifleX instrument redefines the key performance measures for MALDI imaging and allows for completely new projects and measurement strategies. The rapifleX system offers by far the highest laser repetition rate on the market, combined with the best MALDI imaging spatial resolution. The instrument has a removable, self-aligning ion source for highest customer service convenience. The MALDI Tissuetyper solution works up to 20 times faster than traditional MALDI-TOF systems, using Bruker’s break-through, proprietary smartbeam™ 3D laser. The new scanning smartbeam 3D laser provides a fast moving laser-beam which is synchronized with the movement of the MALDI target stage. In combination with the game-changing laser repetition rate of 10 kHz, this architecture allows for real high throughput where MALDI imaging researchers have dramatically increased flexibility in pixel size or target tissue size. Depending on the sample size, typical tissue sections can now be imaged in approximately 30 minutes. 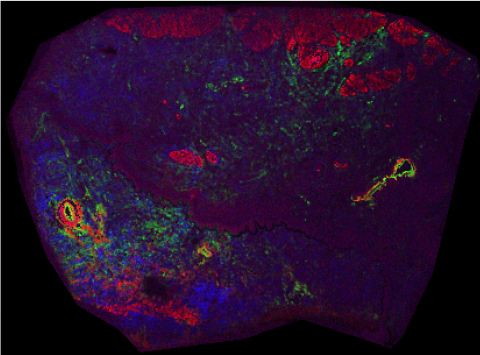 Mass spectrometry images from small tissue biopsies are available within a few minutes. Tissue-typing of protein signature distributions continues to be one of the most powerful techniques available in areas such as anatomical pathology or biomarker research. Current research results indicate potential future clinical pathology applications in tumor staging, supporting therapy decisions or disease prognosis. The MALDI Tissuetyper offers exclusive statistical analysis software and bioinformatics tools for data mining, as well as visualization of two-dimensional and even three-dimensional imaging datasets from multiple tissue sections. The MALDI Tissuetyper solution enables to use MALDI-TOF mass spectrometry as a powerful mass spectrometry imaging (MSI) tool, which is highly complementary to traditional imaging technologies in histology. The MALDI Tissuetyper extracts molecular information as a proteomic fingerprint, which displays peptides and small proteins. In contrast to traditional histological tissue analysis, the MALDI Tissuetyper does neither require a molecular probe nor an antibody. The MALDI Tissuetyper offers multiplex analysis of multiple potential biomarkers simultaneously in an untargeted approach. The MALDI Tissuetyper provides complementary information to immunohistochemistry (IHC) and in many cases can differentiate cell populations that cannot easily be differentiated by IHC. In additionally, it might save valuable biopsy material, in cases where only limited tissue sample is available. The MALDI Tissuetyper can be used for biomarker discovery studies, but also for multi-marker tissue-typing and classification. The MALDI Tissuetyper is for research use only.